This is about a technology designed to generate attractive margins; a product battery owners want to use; a business built on logical financial and technical foundations. A type of technology with an outstanding capacity to extend the service life of motive power batteries - based on a supplement that is conveniently added to motive power battery refill water. It is the easiest way make batteries last longer. If you are currently working for, or have in the past worked for a corporation that sells industrial batteries, this represents the perfect opportunity to more than double your income. Lead-acid batteries have become low profit items due to the fact that they have been in commercial use for a very long time. Switch to selling something new into a market that you understand, something that generates repeat orders. This website has more than 20 pages dedicated to providing detailed technical information about the product, to help you come to an informed decision. An ideal opportunity for an entrepreneurial individual with good communicating skills and a strong desire to succeed in business. Our approach to business has always been "to make the footprints, not to follow in them". We do all our own research and development work. We carefully pick new technologies that our experience and our instincts help us to recognize as having good commercial potential. Break them down into simple constituents. Make 100.00% sure we understand the underlying science. Run exhaustive tests. Slowly and meticulously work out the best way to build them into high quality products. And only after all this preparation begin manufacturing the products. Over 90% of what we have manufactured has been exported. We have been doing business with an associate in the USA since the middle 1980s. He became ill unexpectedly and has sadly passed away. We would like to team up with a business minded marketing/ distribution specialist in the USA to advance this motive power battery treatment concept. Improvement, service life, motive power batteries. The lead-acid battery has been an item of commerce for 130 years. Desulfation remedies have been around for most of this time. The developed world operates between 500 and 800 motor vehicles per 1000 population - in other words, there is nearly one lead-acid battery per person. Battery problems are claimed in desulfation advertisements to be the number-one cause of automobile breakdowns and 85% of battery failures are claimed to be caused by sulfation. Therefore, if sulfation can be reliably treated, there would be a desulfation treatment service center on the main street of every auto parts-and-service retail area in every city. Where are they? The answer is simple. There aren't any because the way these technologies work provides results that are too variable to make enough money to grow this kind of business. Desulfation is like watering dried-out plants. Treating batteries while they work is like the timely watering of healthy plants. Looking after healthy batteries is an inherently logical process. Batteryvitamin is a technology that is predictable, can provide good margins and generate repeat orders. A business endowed with good growth potential. Battery manufacturers are inclined to see Batteryvitamin as a threat to their sales and can therefore be expected to dissuade their customers from using it. It is important to avoid frustration and indecision at battery maintenance management level, and to go directly to top management of the companies that use thousands of batteries. These are people who make decisions to please their shareholders. They understand that saving on battery running costs translates dollar for dollar into profit. Their purchasing power prevents battery manufacturers from trying to dissuade them from using Batteryvitamin. We recommend that you read our articles, 1. Why Understanding Corrosion Is Important, and then 2. Basic Technical Information, after reading this page. We have experience in large projects. We designed and manufactured ancillary equipment for the biggest battery in the world, used for electricity grid load-leveling. 40 MWh, 8256 cells, rated 3250 Ah. Chino, California, 1986/7. Automobile batteries are subject to brief discharging, prolonged charging. This is the reason why automobile batteries are charged at 2.30 to 2.40 volts per cell, equivalent to 13.80 to 14.40 volts for a 12 volt battery. The downside is that when these batteries are used infrequently, they can easily become sulfated. Motive power batteries are subject to prolonged discharging, hurried charging. This is the reason why they are charged to a much higher voltage, 2.55 to 2.65 volts per cell, to make sure they are 100% charged before the next shift. The higher the voltage, the more severe the corrosion. Corrosion is the dominant factor determining the service life of motive power batteries. A. There is a downside to overcharging. It plays out after batteries have spent many productive years in service. The positive plate grids become corroded all the way through, the active material falls out and the batteries become unserviceable. B. Yet there is also a benefit to overcharging. The corrosion it produces actually re-cements the positive active material to the metal surfaces of the positive grids, throughout the life of the batteries, until just before the end. Opportunity. It took us many years to develop a reliable way of suppressing the "bad" corrosion without interfering with the "good" corrosion, so that motive power batteries can confidently be made to last much longer. The majority of us, when asked what line of business we are in, say we are in the battery business. When we say this, we are actually making a fundamental mistake. We are too familiar with the actual nuts and bolts of the business. We have lost sight of the fact that we are in the energy storage business. When customers buy batteries, what they are really after is the enegy storage capability of batteries. It makes very good business sense to provide them with the most cost effective, most durable storage. They are not looking for the lowest price, they are looking for the best energy storage deal. The system we have successfully developed is based on a supplement. No need to measure out individual battery dosages. 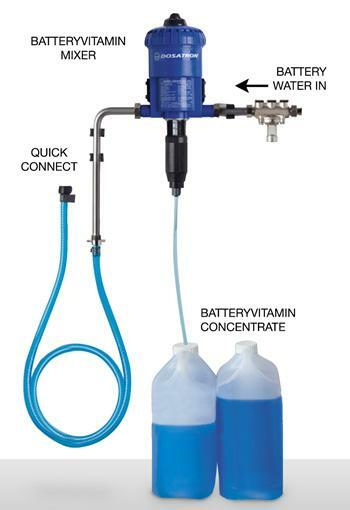 The supplement is applied via the battery refill water. Small batteries use less water, receive less supplement; large and hard working batteries use more water, receive more supplement. The supplement goes to work while the batteries are at work. Batteries continue to be available 100% of the time. The equipment is reliable. Treatment is cost effective. Batteryvitamin generates repeat business. The technology is based on an automatic supplement infusion routine. It is designed to suppress corrosion and typically extends motive power battery service life by 40%, (max. 60%). It is installed on site - it is automatic - no operator in attendance required. A technology that can make every battery that receives treatment last longer. The financial benefits that accrue to the owners of batteries can be measured in hundreds of thousands of dollars. 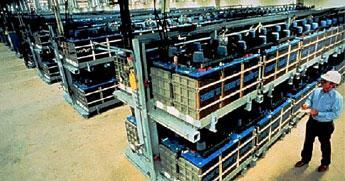 Our first installation was in 2000: Ford Motor Company, Brownstown, Detroit, 950 batteries. One of our more recent installations: Pick n Pay distribution warehouse, Longmeadow, Johannesburg, 1400 batteries. Electric forklifts are used almost exclusively nowadays to move goods around indoors. Motive power battery fleets of 200 to 1600 batteries are to be found in supermarket and perishable goods warehouses, food and beverage factories, automobile factories, logistics terminals, underground mining operations, etc. Value. A 400-battery warehouse is about average. 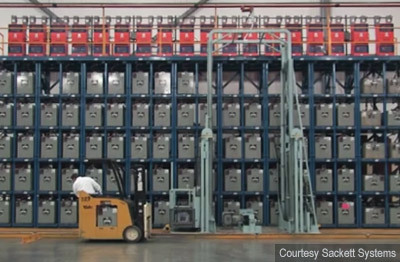 There are many hundreds of warehouses that run this number of batteries, for example, in the USA and in Europe. (You can verify this by searching "supermarket warehouse location", by name, by country, on line.) Each one accounts for an investment in batteries of approximately 400 X $3500 = $1.4 million. 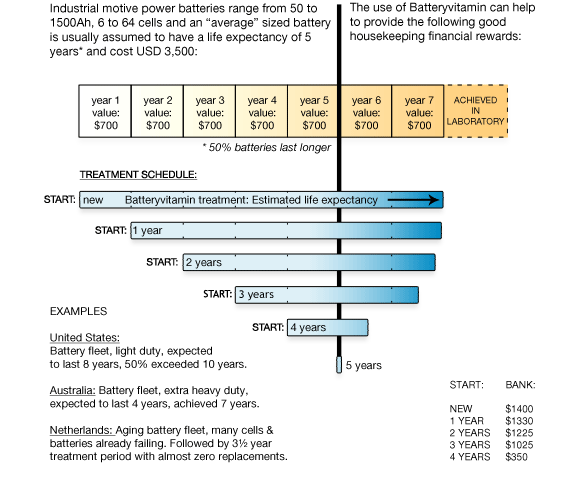 Batteryvitamin typically provides an extra 40% in service life, which represents a savings of $560,000. It is not unrealistic to charge the customer 20% of the savings - $112,000. Savings for 1 battery - $1400. Savings for 1000 batteries - $1.4 million. No one has ever thought of treating batteries via the battery refill water. There is no competition. The technology is protected - see our article "Copyrights, Designs & Patents". The nature of this type of business requires expert teamwork - mastery in terms of technology and mastery in terms of marketing. Corporate managements want to meet the team, assess the team. It is important to work together, to complement each other's strengths, to build on individual experience and knowhow. This is about investment of intellect, not about investment of money. We believe we are very good at what we do, but we cannot be everywhere. We want to team up with a versatile entrepreneurial sales/ marketing specialist in the USA, who is used to dealing with people at the top and, together make this thing work incredibly well. This is what we would do. We would fly over, demonstrate the technology and assist in person with sales presentations to large logistics operators. We are accustomed to dealing with clients at top management level. Our approach is constructive, interactive. We understand the subject. We stick to the facts and are comfortable dealing with interrogative questioning. If you want to visit one of our installations, we suggest you get on a plane, we'll show you. Batteryvitamin is a "classic disruptive technology". We began our journey by asking battery researchers and leading manufacturers of rubber battery separators why rubber works so well in batteries. Several responded by telling us they all understood what it does but that no one had yet managed to work out the underlying mechanism. This spiked our curiousity. The theoretical size of the opportunity is equal to the total battery manufacturing output of the second and third largest lead-acid battery manufacturers in the world combined. This website provides 20 pages of information on technology, business and financial details, as well as other useful information. For company details, please go to the Contact us page. As a matter of interest, Batteryvitamin treatment brings down overall running costs to about half the cost of hydrogen fuel cell power.